Definition at line 156582 of file Cxx_Grammar.h. Returns pointer to copy of SgWhileStmt. 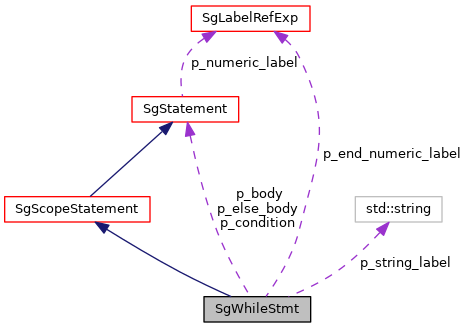 Cast function (from derived class to SgWhileStmt pointer). This functions returns a SgWhileStmt pointer for any input of a pointer to an object derived from a SgWhileStmt. Returns valid pointer to SgWhileStmt if input is derived from a SgLocatedNode. This pointer to an SgStatement holds the body of the 'else' block. This member is intended for use with Python, and should be NULL otherwise. Definition at line 157080 of file Cxx_Grammar.h.